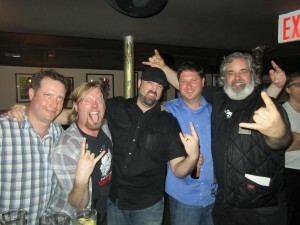 Idle Hands is the bar to be at if you like Bourbon, Beer & Rock. We have one of the largest selections of Bourbon in all the city, 40+ rotating Craft Beers and 7 nights a week of Rock Music. Our signature event is the weekly Wednesday night $10 tasting. Each week we feature a different Brewery & Distillery and bring in brand managers for a 2 hour tasting event from 7 – 9 pm. The best part? It only costs $10!!! 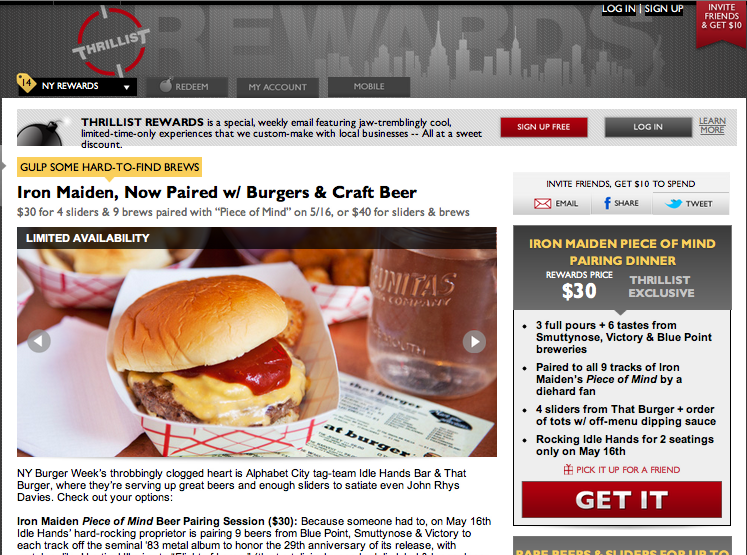 To celebrate American Craft Beer & NY Burger Week, we put together a VERY special version of our weekly $10 Tasting. Join us for a VERY SPECIAL edition of our weekly $10 Tasting event. 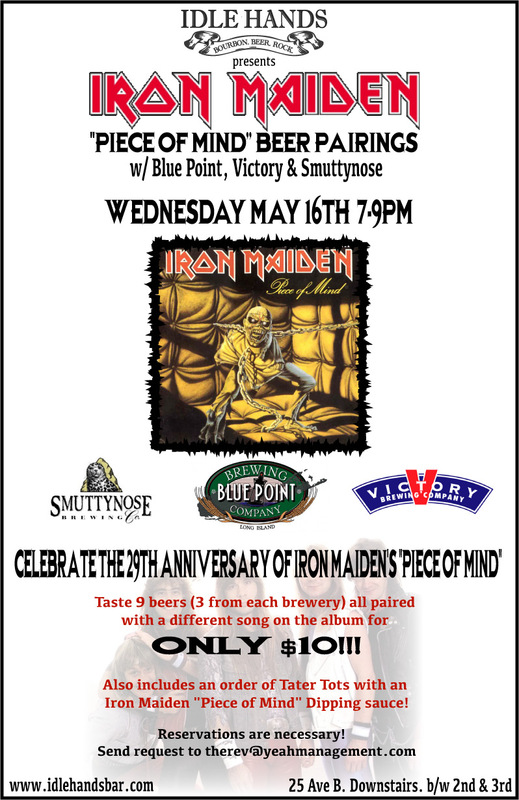 Tonight we celebrate the 29th anniversary of Iron Maiden’s “Piece of Mind.” On this date in 1983 the leaders of the New Wave of British Heavy Metal released what is now considered one of the most celebrated pieces of music ever. 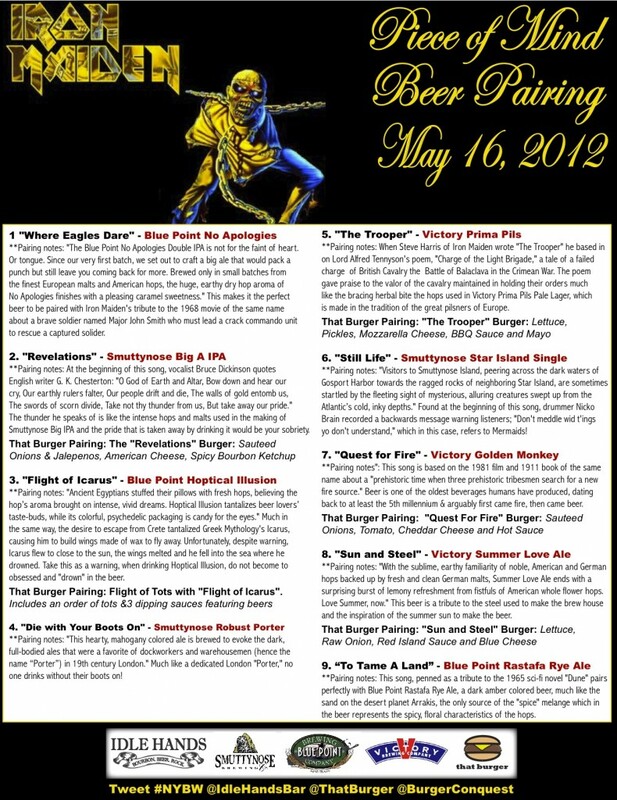 On this date in 2012 we welcome representatives from 3 of our favorite breweries to do a perfect craft beer pairing with all 9 songs on the album! **Pairing notes: “The Blue Point No Apologies Double IPA is not for the faint of heart. Or tongue. Since our very first batch, we set out to craft a big ale that would pack a punch but still leave you coming back for more. Brewed only in small batches from the finest European malts and American hops, the huge, earthy dry hop aroma of No Apologies finishes with a pleasing caramel sweetness. ” This makes it the perfect beer to be paired with Iron Maiden’s tribute to the 1968 movie of the same name about a brave soldier named Major John Smith who must lead a crack commando unit to rescue a captured solider. **Pairing notes: At the beginning of this song, vocalist Bruce Dickinson quotes English writer G. K. Chesterton: “O God of Earth and Altar, Bow down and hear our cry, Our earthly rulers falter, Our people drift and die, The walls of gold entomb us, The swords of scorn divide, Take not thy thunder from us, But take away our pride.” The thunder he speaks of is like the intense hops and malts used in the making of Smuttynose Big IPA and the pride that is taken away by drinking it would be your sobriety. **Pairing notes: “Ancient Egyptians stuffed their pillows with fresh hops, believing the hop’s aroma brought on intense, vivid dreams. Hoptical Illusion tantalizes beer lovers’ taste-buds, while its colorful, psychedelic packaging is candy for the eyes.” Much in the same way, the desire to escape from Crete tantalized Greek Mythology’s Icarus, causing him to build wings made of wax to fly away. Unfortunately, despite warning, Icarus flew to close to the sun, the wings melted and he fell into the sea where he drowned. Take this as a warning, when drinking Hoptical Illusion, do not become to obsessed and “drown” in the beer. That Burger Pairing: Flight of Tots with “Flight of Icarus”. Includes an order of tots and 3 dipping sauces featuring beers. **Pairing notes: “This hearty, mahogany colored ale is brewed to evoke the dark, full-bodied ales that were a favorite of dockworkers and warehousemen (hence the name “Porter”) in 19th century London.” Much like a dedicated London “Porter,” no one drinks without their boots on! **Pairing notes: When Steve Harris of Iron Maiden wrote “The Trooper” he based in on Lord Alfred Tennyson’s poem, “Charge of the Light Brigade,” a tale of a failed charge of British Cavalry the Battle of Balaclava in the Crimean War. The poem gave praise to the valor of the cavalry maintained in holding their orders much like the bracing herbal bite the hops used in Victory Prima Pils Pale Lager, which is made in the tradition of the great pilsners of Europe. **Pairing notes”: This song is based on the 1981 film and 1911 book of the same name about a “prehistoric time when three prehistoric tribesmen search for a new fire source.” Beer is one of the oldest beverages humans have produced, dating back to at least the 5th millennium & arguably first came fire, then came beer. **Pairing notes: “With the sublime, earthy familiarity of noble, American and German hops backed up by fresh and clean German malts, Summer Love Ale ends with a surprising burst of lemony refreshment from fistfuls of American whole flower hops. Love Summer, now.” This beer is a tribute to the steel used to make the brew house and the inspiration of the summer sun to make the beer. **Pairing notes: This song, penned as a tribute to the 1965 sci-fi novel “Dune” pairs perfectly with Blue Point Rastafa Rye Ale, a dark amber colored beer, much like the sand on the desert planet Arrakis, the only source of the “spice” melange which in the beer represents the spicy, floral characteristics of the hops. VERY special thanks go to Sean McCain from Victory Brewing, Shane Byrnes from Blue Point Brewing and Pat Fondiller from Smuttynose Brewery. Without them, this event would’ve never happened. You guys are the best and we appreciate what you do for our bar. Cheers to beers bros! Join us for a VERY SPECIAL edition of our weekly $10 Tasting event. Not only is it Rev (one of the bar’s owners) birthday’s but tonight we celebrate the 22nd anniversary of Pantera’s “Cowboys From Hell.” On July 24th in 1990 the boys from Arlington, Texas released an album that changed the face of heavy metal. On this date in 2012 we celebrate it’s release with “Cowboys From Hell” Beer pairings with Oskar Blues Brewery. This entry was posted in Bar, Beer, Best Burger in New York, Burgers, East Village, Event, Gourmet Burgers, Hamburgers, National Hamburger Month, New York, NY Burger Week, Thrillist Rewards and tagged $10 tasting, beer pairing, best burger nyc, blue point brewery, burger conquest, cheese, ciancio, east village, french fries, hamburger, Idle Hands, idle hands bar, iron maiden, new york, ny, NY Burger Week, nyc, piece of mind, rev, review, smuttynose, that burger, the rev meter for social community, thrillist, thrillist rewards, victory brewing. Bookmark the permalink.